Below you will find a list of all the Mars Casino bonuses - offered to new players. The right side offers a casino overview (click to scroll through the images). 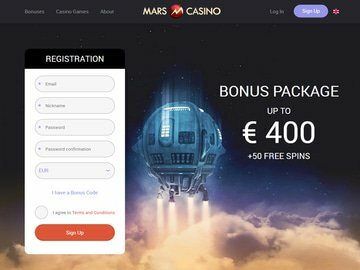 Mars Casino was established in 2016 as a cash money casino, powered by the worlds top software developers, the casino has quickly become one of the prime gaming destinations offering hundreds of games. Furthermore, the range of games offers is attractive, making resisting the promotions hard to accomplish. The casino is owned and operated by SoftSwiss N.V. Casinos, it is offered only in the language of English. The Canadian dollar, Australian Dollar, British Pound, Norwegian Kroner, U.S. Dollar, Euro and Bitcoins are the available currencies. Thusly, giving wide range to potential players. Online Casinos that are a part of multiple gaming networks are focused on providing promotions, in hopes of gaining more players. The continuous cycle resulting in both players and the casino benefiting. MarsCasino is well liked by Canadian punters, who get to enjoy substantial welcome promotions. This welcome bonus includes a 100% match bonus and 50 Free Spins. Consistent playing will have a 25% match bonus gained on the second deposit as well. Annual bonuses include the reload bonus, occurring twice a week, receive cash back when $20 or higher is deposited into accounts. This is a 25% Reload Bonuses that launches every Wednesday and Monday. There are daily free spins that occur when players make three separate deposits of $20 or higher per day. 25 free spins are rewarded on the third deposit. The casino wishes to be hospitable hosts and to do so gives a 15% special loyalty bonus when deposits are made four days in a row. The 4th day will have 15% of the accumulated deposits rewarded back to accounts. 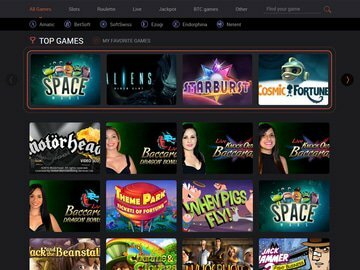 The library of games at Mars Casino are popular instant-play styled titles from software providers including NetEnt, Amatic Industries, Betsoft, Microgaming, iSoftBet, Ezugi, and Endorphina. The result is a brilliant balance of video slots and table games. Roulette, video slots, live casino games, card games, video poker and an extended variety of arcade games are available. The selection of games available consists of some that normally wouldn't be found at other casinos. Canadian players are eager to take home large payouts from games like Aztec Magic or Book of Pyramids. Regulation laws have rained down onto the Canadian market, meaning the hundreds of games available at this casino have been limited to 38. European players have full access to the full list of games like Warlords, Dr. Jekyll and Mr. Hyde, Booz of Aztecs and Twerk. All games will be available on Android and Apple mobile devices. 3D Animations come to life on mobile platforms in the same way that they do on desktop platforms. The casino is licensed by the Curacao eGaming Association and managed by Direx N.V. Safety. Privacy and safety for the players are two of Mars Casinos largest priorities. SSL Encryption keeps all information stored on private servers that are then protected by firewalls into the mainframe. The software is also subject to annual auditing, ensuring players of safety. Casino Mars uses the most trusted banking options available on the web. Members wanting to remain anonymous may select to gamble in Bitcoins. Other currencies include Euro's, U.S. Dollars and Australian Dollars. Canadian players are forced in using Bitcoin, those new to the Bitcoin system may access a ten-step guide through customer support. When not using Bitcoin, Maestro, Neteller, PaySafe Card, Visa, Bank Wire Transfers, MasterCard and Sofortuberwaisung may be used. The support team is available in a variety of formats, the first being the common and convenient format of live chat. Should the live chat happen to be offline, then support maybe contacted through email. As an added addition, there's also an "F.A.Q" section that has the most commonly asked questions regarding the casino answered. MarsCasino has all the things that are amazing about the gambling experience. Its choices in games are suited for any players, being a cash money and bitcoin-focused platform, this casino can appeal to greater numbers. The promotions, free spins welcome package and numerous software only helps to make this casino appealing.